The Golden Parakeet or Golden Conure (Guaruba guarouba), is a medium-size golden yellow Neotropical parrot native to the Amazon basin of interior northern Brazil. Its plumage is mostly bright yellow, hence its common name, but it also possesses green remiges. It lives in the drier, upland rainforests in Amazonian Brazil, and is threatened by deforestation and flooding, and also by the now-illegal trapping of wild individuals for the pet trade. It is listed on CITES appendix I.
German ornithologist Georg Marcgraf first described the bird, called ‘Guaruba’ in his expedition to Dutch Brazil in 1638. Its Portuguese and indigenous name, ‘Ararajuba,’ means small yellow macaw. In aviculture, it is sometimes known as the Queen of Bavaria Conure. Formerly classified as Aratinga guarouba, it is now a species in the monotypic genus Guaruba, one of numerous genera of New World long-tailed parrots in tribe Arini, which also includes the Central and South American macaws. Tribe Arini together with the Amazonian parrots and a few miscellaneous genera make up subfamily Arinae of Neotropical parrots in family Psittacidae of true parrots. The specific name guarouba (alternately guaruba) is derived from Old Tupi: guará, small bird; and Old Tupi: yuba, yellow; hence “small yellow bird”. The different spellings of the genus and species names results from the different spellings used by Lesson and Gmelin when they postulated the taxons. The taxonomic convention is to retain the names as spelled by the original authorities. Molecular studies show that Guaruba and Diopsittaca (Red-shouldered Macaw) are sister genera. It is also closely related to Leptosittaca branicki Golden-plumed Parakeet. The Golden Parakeet is 34 cm (13 in) long and mainly yellow with green in outer wings and with an all-yellow tail. It has a large horn-coloured beak, pale-pink bare eye-rings, brown irises, and pink legs. Male and female have identical external appearance. Juveniles are duller and have less yellow and more green plumage than the adults. The juvenile’s head and neck are mostly green, the back is green and yellow, the upper side of tail is mostly green, the breast is greenish, the eye-rings are pale-grey, and the legs are brown. Its range is estimated to be limited to approx. 174,000sq.km. between the Tocantins, lower Xingu and Tapajós rivers in the Amazon basin south of the Amazon River in the state of Pará, northern Brazil. There are additional records from adjacent northern Maranhão. The birds in a 1986 study used two different habitats during the year; during the non-breeding season, which coincided with the dry season, they occupied the tall forest. During the breeding season they left the tall forest and entered open areas on the edge of the forest such as fields used in agriculture. 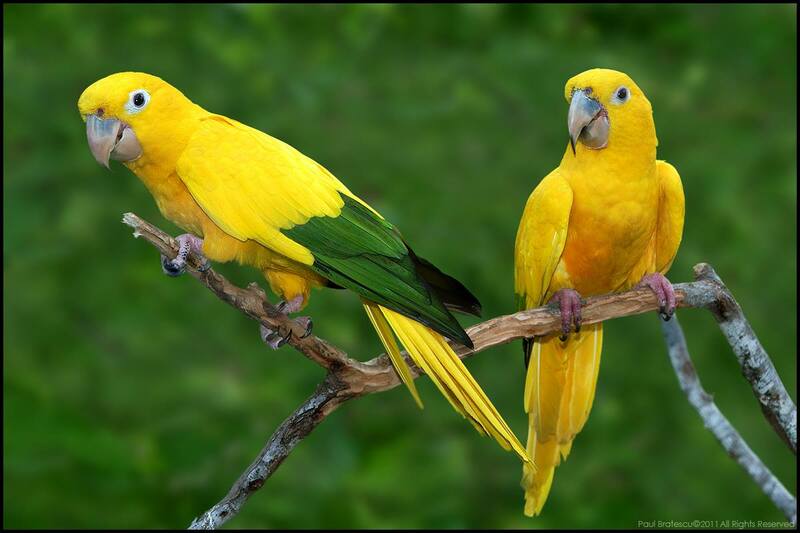 Golden Parakeets are a sociable species, living, feeding, sleeping and even breeding together. They eat fruits, flowers, buds, seeds, and cultured maize in the wild. These include the seed of Croton matouensis, which is related to the castor oil plant; Muruci fruit (Byrsonima crispa); mangoes; and Açaí fruits. The Golden Parakeet has a breeding system that is almost unique amongst parrots, as pairs are aided by a number of helpers which aid in the raising of the young. This behavior is less common with parakeets in captivity, who often abandon their young after three weeks. After the Golden Parakeet reaches sexual maturity at the age of three years, the breeding season starts in November and runs through February. They nest in a high tree, in deeper than average nesting cavities, and lay an average of four 37.1-by-29.9-millimeter (1.46 by 1.18 in) eggs, which they aggressively guard. The incubation period is about 30 days, in which the male and female take turns incubating. In the first few years of sexual maturity, Golden Parakeets tend to lay infertile clutches until the age of six to eight. In captivity, Golden Parakeets will resume breeding when their chicks are taken from them. At birth, Golden Parakeets are covered in white down that eventually turns darker within a week. By the end of the third week, wing feathers start to develop. Juveniles are playful, but may turn abusive against their peers. Nestlings are preyed upon by toucans, a fact that may explain their social behaviour. Nests are vigorously defended from toucans by several members of the group. The Golden Parakeet is listed on the IUCN Red List as Vulnerable. This is largely due to deforestation and the capture of wild birds for aviculture, where it is in high demand due to the attractiveness of its plumage. Locally, they are considered as pests for feeding on crops, and are hunted for food or sport. Current population is estimated to be in the range of 10,000-20,000. An example of the displacement of Golden Parakeets by habitat loss comes from the building of the Turucuí Dam, Pará, from 1975-1984. More than 35,000 forest dwellers were forced from what had been a habitat that was considered to be “among the richest and most diversified in the world.” In addition, 2,875 square kilometers (1,110 sq mi) of rainforest were flooded, and 1,600 islands were produced by the flooding, all of which were heavily deforested. Copyright © 2019 All About Birds. All Rights Reserved. The Tonic Theme by bavotasan.com.